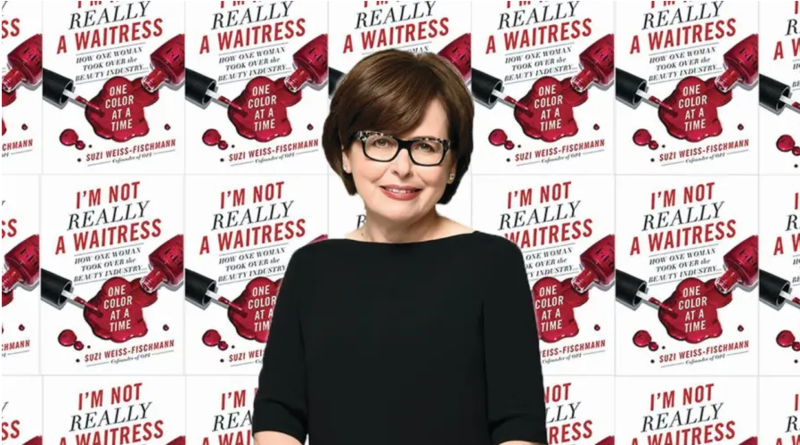 In ‘I’m Not Really a Waitress’, Weiss-Fischmann tells how she went from a childhood in Communist Hungary – to becoming globally recognized as the First Lady of Nails. Suzi Weiss-Fischmann, 62, used to aggressively bite her nails. It was a chronic, nervous tick, and it had to stop. After all, she was the co-founder and creative director of a global nail polish company, and chewed-up cuticles weren’t a good look for the woman shaping the beauty industry. This is just one fascinating tidbit from I’m Not Really a Waitress, Weiss-Fischmann’s new book about how she went from a childhood in Communist Hungary – where she secretly studied Hebrew with a rabbi – to becoming globally recognized as the First Lady of Nails. A second-generation Holocaust survivor, Weiss-Fischmann is the fiery Jewish mom behind OPI, the nail lacquer brand known for its witty color names. When she started the company with her brother-in-law, George Schaeffer, in the mid-1980s, they knew nothing about nails. Nu? Just why did they plunge into the manicure business? The nail industry needed a splash of glamour, and with Weiss-Fischmann’s eye for color, the duo confidently pounced on the opportunity ripe for the taking. And thus OPI – it stands for Odontorium Products Inc. – was born. In I’m Not Really a Waitress – the title is also an iconic nail polish color – Weiss-Fischmann chronicles her road to changing the beauty game. Kveller caught up with the soon-to-be grandmother to talk about the Jewish values that influenced OPI’s success, and how she earned her title as the First Lady of Nails. In the beginning of the book, you talk about – in contrast to the United States – growing up in an environment where women had careers and didn’t rely on their husbands for an income. How did that affect your character and your career? There’s no limitation to women. The only limitations are what you put on yourself. I grew up where women were doctors, engineers, lawyers, and they were all university educated. The men usually seemed like losers, or, you know, maybe less accomplished. I never felt that I couldn’t do anything, and when somebody made a stupid remark, I shrugged it off. The names were such a huge part of the brand’s DNA. It was always based on a geographic location, and, of course, we love to eat, so we always had food from the respective city or country that the collection was named after, and then we kind of just had fun. I mean, we came up with literally crazy names – of course, some unmentionables, for obvious reasons. But it was a democratic process. So the names went up on the board, and the majority vote won. It was the highlight of every collection and every season. I think, as the years went on, we just got better and better. The names aged like wine – they got more humorous. I would go into salons sometimes and watch people anticipating the new colors of a collection. But just as much as they anticipated the colors, they always flipped the bottle to see the names. That’s what gave them that personal connection with OPI. It was so important to us to gain the loyalty of the consumer. My parents. My mom is an amazing little lady, she’s so strong. I mean, she was my hero. My dad was a very loving father, he was very family-oriented. At work, it was George Schaeffer, my brother-in-law. He was a great business leader and teacher. As for fashion, I love Chanel. I think, as far as leaders, I’d say Golda Meir. I’m not just naming her because she’s a woman. I think she was an amazing leader, and role model to all women, not just Jewish.You wrote a lot about the Shabbat dinners you hosted every week. Tell me about them. You have to prioritize. Certain things you have to do for yourself because, you know, us women are multitaskers. We can do so many things: We’re organizers, we take care of the budget, we plan the meals. I mean, there has to be a new adjective to describe what women do. So it’s time to take a few minutes, or an hour, just for yourself. Getting a manicure and pedicure is always kind of that main getaway because, you know, you get a little massage and it gives you that instant gratification. I loved everything that I did with OPI, but my greatest passion are my two kids and my husband. I mean, you know, the family is always No. 1. That’s how I grew up, and, you know, in this crazy world, as I say, it’s your family that’s always there. At the end of the book, you said that your new passion is to pass on everything you learned on your OPI journey to the next generation, l’dor vador. Why is it important to you that you share your story? I think storytelling is very important. I feel that it’s my duty to help raise new leaders that are in business and philanthropy. It’s so important to be able to share with other people and inspire other people to achieve great things. And I feel like it’s what I can do best now. And what do us women do best when we get together? Tell our stories.